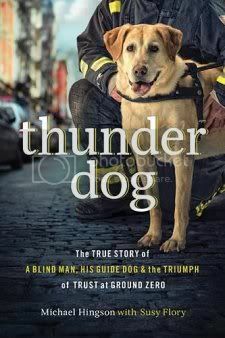 On a whim, I requested Thunder Dog: The True Story of a Blind Man, His Guide Dog & the Triumphs of Trust at Ground Zero by Michael Hingson to review a week or so ago. It looked like it would be a fairly easy read, and that is what I was in the mood for. It turned out that it was gripping, compelling -- a real page-turner. Once I started it, I had a very hard time putting it down. The basic story -- Michael and his guide dog, Roselle, are at work one day nearly a decade ago, preparing for a sales presentation. Michael works on the 78th floor of the World Trade Center, and obviously (given the title) this day is going to be far from normal, as it is 9/11. An explosion rocks the building, and Michael and his co-worker get their clients to evacuate, while they shut some things down and finally head out themselves. The main narrative of Thunder Dog relates Michael and Roselle working together to get down 78 flights of stairs and away from the tower, which collapses shortly after they get out. Obviously, since Michael is the author, we know he is going to make it out. Still, I kept flipping page after page as I really wanted to find out more. Michael recalls earlier scenes in his life, so we learn about his childhood. He was born on my birthday (or rather, *I* was born on his 17th birthday!) -- a couple of months early. That means he was treated like virtually every other preemie in that generation -- given excessive oxygen, causing his blindness. Michael tells about his childhood, his first guide dog, attending college, driving a car, flying a plane... and escaping Ground Zero. The book made me laugh. A lot. It made me cry. Towards the middle of the book, there were a couple sections told from the point of view of Michael's wife that I really appreciated. I will have my children read this when we get to really recent history. Because this story is incredibly inspiring, and it definitely brings an interesting point of view to 9/11. Disclaimer: As a Booksneeze Blogger, I did receive this as an ePub book from Thomas Nelson. No other compensation was received. For more about my take on reviews, visit my blog post here. Hey Debra, my hubby thinks this dog was from his school he works for (Guiding Eyes for the Blind)...does it mention that in the book? Okay, it is Guide Dogs for the Blind located in San Rafael, CA. There was another guide dog team located on the 71st floor of Tower One. I believe Salty was from Guiding Eyes. Omar has chosen not to be overly out going which I, of course, respect. He is mentioned in passing in the book.